Even though I love dreaming up healthy alternative recipes for them, there has to be something to eat on the table besides the cookies. So here’s a festive holiday dish that’s bright and cheery to welcome the return of the light. With colors of flame and all the wonderful antioxidants that go with them. Light but filling. Healthy but tasty. And totally gluten-free and vegan. Christmas was always Italian food when I was growing up: plates of antipasto, lasagna, bragioli (pounded, stuffed steak). Being vegan and mostly flour free sends me in search of innovative alternatives. These peppers side step any need for soy, noodles, or processed flour. even gluten-free flour. The peppers themselves lend an Italian flair, as do the optional pine nuts. And the cheese sauce tastes surprisingly decadent, despite its healthy profile. Though I’ll probably stuff some gluten-free large brown rice pasta “shells” with a white bean filling of some kind, serving these with them will make certain I get to keep eating some of my favorite nourishing whole foods as part of the week of celebrations. Make the Cheesy Cauliflower Sauce according to Susan’s directions and set aside. If using, lightly toast the pine nuts in a 275 degree oven (I wish I could tell you how long. I forgot about them and simply took them out when I started to smell them. With the oven that low, it’s pretty hard to burn them.) If you need to cook the millet, do this while the cauliflower is cooking for the sauce. Once you have your sauce made, steam the butternut squash cubes, whether fresh or frozen. If you already have cooked millet on hand, you can warm it up by steaming it with the squash. Chop up the green onion. Mix the millet, squash, pine nuts, green onions, garlic and about a cup of the sauce together until well combined. I didn’t measure how much sauce I used, I just added it until the mixture tasted good and seemed to have a creamy enough consistency. Half the red bell peppers lengthwise and remove the seeds and the stem. Stuff them with the mixture. 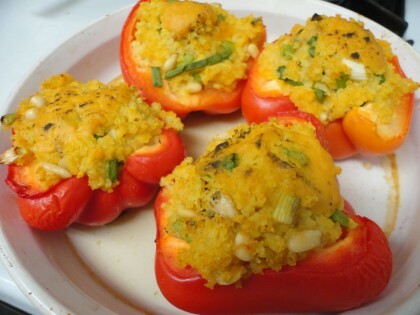 Place the stuffed peppers in a shallow baking dish. Sprinkle tops with poultry seasoning and ladle a little extra cheesy cauliflower sauce on top of each one. Line the baking dish with a thin layer of water or broth. Bake at 350 uncovered for 30-35 minutes. (You can add more water or broth if needed during the baking.) Serve with steamed greens and corn kernels and extra Cheesy Cauliflower Sauce and poultry seasoning, if desired. Notes: This temperature and method of baking the peppers steams them, leaving them bright and slightly crunchy, like any lightly steamed vegetable. I like them this way. If you would rather have them cooked to a much softer mushier consistency, try increasing the oven temperature to 375 and baking them for 45 minutes to an hour. It might also be a good idea to cover them while they bake so they don’t dry out. Originally I meant to steam some frozen corn kernels along with the squash and add them to the mixture, but I forgot. So I ended up throwing a good sized fistful into the steamer along with the kale and arugula I steamed to go with the peppers. I ended up liking it better this way. But if you would like to add corn to the stuffing mixture, or substitute it for the pine nuts so you can have a completely fat free version, that would work too. They add a nice sweetness and texture that compliments everything else. I’ll be increasing the amount of millet, squash and onions in this recipe for Christmas Eve most likely, but even so, I think one batch of Cheesy Cauliflower Sauce will do fine for stuffing 4 or even 5 peppers, depending on their size, of course. Solstice is my perhaps my favorite day of the year. I love the beauty of Winter up north (at least in December I do–I’m not such a huge fan of it by early March) and the pause the sun makes before climbing higher again in the sky. 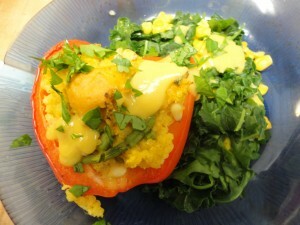 But if you are “down under” you can still celebrate the sun with these bright and creamy peppers. If it’s too hot to turn on the oven, try making a salad of this dish to salute the sun at its highest point in the sky. Either way, your plate will shine with whole food goodness. These look delicious! I don’t have millett, but I have quinoa. I’m trying it this week! Thanks, Jamie! Welcome. 🙂 I think these would be great with quinoa. Enjoy! I love stuffed peppers! I haven’t tried Susan’s cheese sauce yet, but I will soon – it seems like the perfect addition to the peppers.